Opened in 2008 to critical acclaim, Pound Ridge is located in tony Westchester County, roughly an hour from Manhattan and just minutes from the financial and business hubs of Greenwich, Stamford and Norwalk, Conn.
Crafted by Dye, his son Perry (of Dye Designs) and long-time construction manager/lead shaper Michael Langkau, Pound Ridge is a wall-to-wall bentgrass facility, hewn from 172 acres of magnificent cliffs, streams and wooded hills. 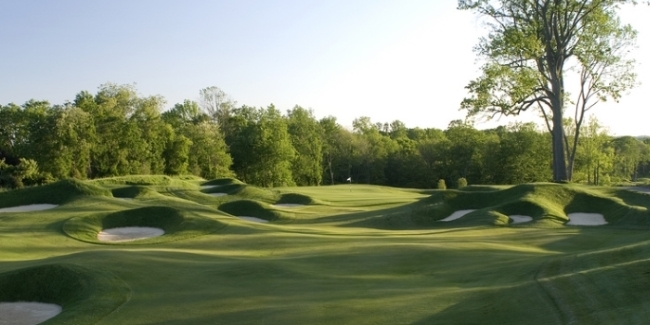 In a region populated by famous private clubs, Pound Ridge stands out as a beacon for high-end daily fee play. Ken Wang - M.I.T. and Harvard alum, and brother of famed fashion designer Vera - owns the golf club and has made it his labor of love. Wang is the president of U.S. Summit, a global marketing and distribution company his father helped found in 1946. U.S. Summit has been very active in Asia over the years, as it owns the Pureen brand of baby products. Wang played golf all over the world, but developed a deep affinity and appreciation for Pete Dye courses. He cites the famed Stadium Course at TPC Sawgrass as one of his favorites and the source of an on-course epiphany. He compares a round at the storied PGA TOUR venue to "standing in the middle of a giant math problem conjured up by a master of geometry." At Pound Ridge, the numbers add up to an unforgettable experience that should be a part of any globetrotting golfer's must-play list. Dramatic rock formations and boulders were left onsite by the Dye team, creating one of the most visually stunning settings for golf in the United States. More than 14,000-linear-feet of rock walls frame a strikingly natural property graced with thousands of trees, subtle wetlands and (in strategic locations) severely-sloped hills. Contoured fairways wind through hardwood forests and fescue mounds, leading to open meadows crowned by picturesque green complexes. The par-72, 7,165-yard layout features some of the highest points in the region, with a number of tee boxes offering expansive vistas of the surrounding countryside. Notable holes include: the par-5, 13th, home to "Pete's Rock," a giant boulder that rests in the middle of the fairway; and the par-3 15th hole, dubbed "Headstone," which is flanked on the right by a large rock outcropping that protrudes into the elongated, 9,000-square-foot green. 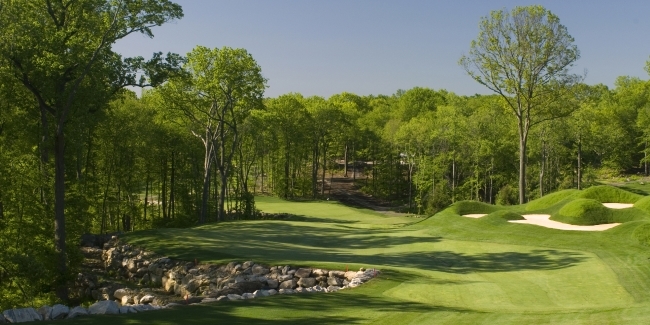 Pound Ridge houses a practice range, short game area and putting green. All guests receive a complimentary yardage book, bottled water and range balls. Carts are now equipped with GPS for obtaining dead-aim-accurate yardages from any position, or ordering food at the turn. Log onto www.poundridgegolf.com for more information about the golf course, rates, and to view a new drone flyover of the entire layout.